Please refer to your A/C No. (Consumer No) in case of any inquiry. Please call the concerned customer care center if you don't receive your monthly bill by at least the 10th of each month. If you would like to receive your monthly bill by mail, please approach the concerned customer care center or the Head Office to fill a special form. To know your Customer Care Center, please refer to Locate Us page. If you woud like to recieve your monthly bill via email, please register with Online SEWA Account and provide a valid email ID. 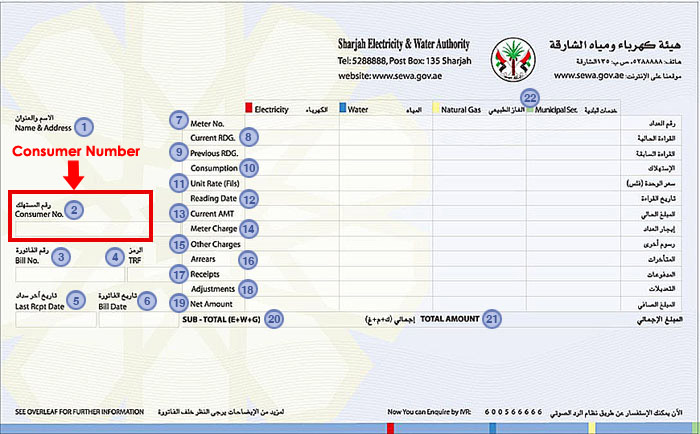 If the monthly bill is not paid within a period of one week, your supply will be disconnected. In this case, the specified fee should be paid for restoring the supply. If supply is disconnected due to non-payment, you should approach the concerned customer care center to settle the outstanding dues and pay the specified fee for restoring the supply. Before traveling abroad for your annual vacation, please arrange to settle all dues in order to avoid disconnection of supply from your premise during your absence. For any inquiry, please do not hesitate to call the concerned customer care center. For inspecting your meter, the relevant form may be filled upon payment of the specified fees. Transfer of the deposit amount to another party will not be accepted unless the same is approved by the concerned department.